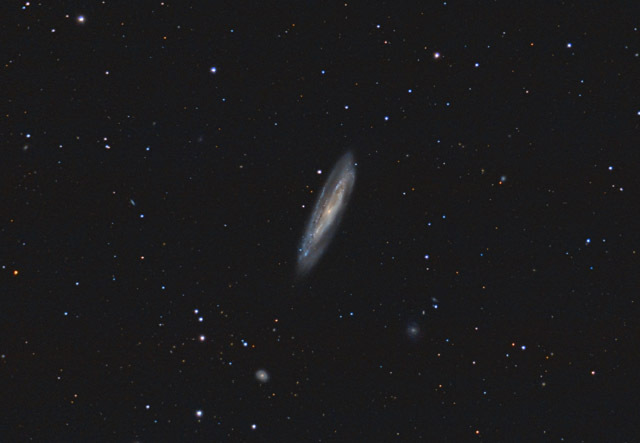 M98 is a spiral galaxy which also displays some evidence of a central bar. Our view of this pretty galaxy is almost edge on. One of the faintest galaxies in Messier's catalogue, M98 is also believed to be a member of the Virgo cluster of galaxies. In this photo, North is up. This image is cropped to 62% of the original full frame. Software Used Images Plus 5.0 for camera control, Images plus 5.5 for calibration, stacking, digital development, star size reduction and halo reduction, smoothing and noise reduction, advanced Lucy-Richardson deconvolution, and multiresolution sharpening. Photoshop CS5 used for levels and curves, high pass filter, star shrinking, screen mask invert, lab color, saturation adjustments, match color, and selective color. Gradient Xterminator for gradient removal. Straton for star removal. Carboni Tools for additional noise reduction, and smoothing. HLVG for additional color correction. Registar for aligning stacks. Focus Magic for focus restoration. Notes M98 is not commonly photographed, which certainly surprises me. The galaxy has a lot of interesting details, and the surrounding field has a number of very nice background galaxies. Overall, I'm fairly pleased with this image, as I like the color and nice details in the main galaxy.